The pursuit of speed puts the single greatest pressure on greenkeepers to enhance performance of greens. Greenkeepers need to look for new techniques to sustainably manage faster surfaces more effectively, as well as focussing on the quality of ball roll and, most crucially, the trueness of the surface, according to STRI agronomist, Henry Bechelet. 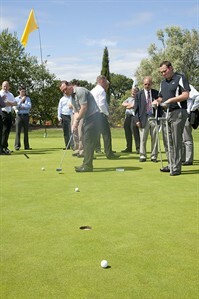 At Turf Science Live, organised by Syngenta and Everris (formerly named Scotts) at The Belfry last month, he demonstrated that Primo Maxx treated greens cut at 4mm and rolled with a turf iron could run faster and smoother than when cut at 3mm alone. "Over recent years greenkeepers have been cutting tighter and tighter to get the speed up, but that can put real stress on the plant and make it more susceptible to all sorts of problems. When you intensify any part of the management it almost inevitably creates issues that require extra inputs to resolve," reported Mr Bechelet (above). Co-presenting the demonstration, Ed Carter of Everris, added: "The beauty of Primo Maxx is that it can relieve pressure at almost every point of turf surface management. When it's included in the programme it may be possible to ease back on other inputs and activities, which can be a real benefit for managing turf health. "Not only does Primo Maxx improve the turf plants' ability to withstand the impact of stress, through improved rooting and physiological effects, but it will also enhance turf playing quality. 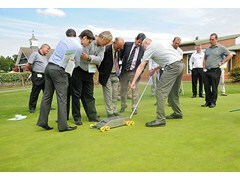 It also gives greater flexibility and cost savings for cutting and turf management," he advised. Mr Carter added that an Everris liquid fertilizer should always be included in the tank mix to promote healthy turf quality, as demonstrated on the Turf Science Live trial. 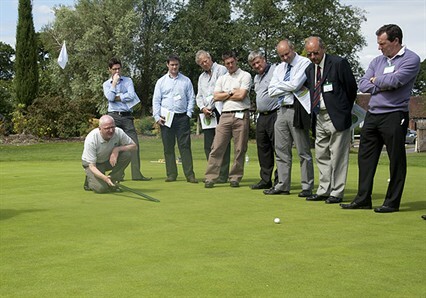 Henry Bechelet also urged greenkeepers to look at other techniques that can take stress off the plant, including raising cutting height; an increase from 3mm to 4mm means 33% more leaf area and the potential for plants to look after themselves more healthily. Rolling, for example, could alleviate the daily cutting regime for some clubs, with positive implications for cost and time saving. "Producing a denser surface from healthier plants enables the ball to roll across the top rather than sinking in, which can in itself increase speed without detriment to health - and it's more sustainable in the long term," he added. STRI experience in monitoring and managing daily greens' performance at Major golf tournaments and through the STRI Programme has shown that even slightly raising the cutting height can help improve the smoothness and trueness of the putting surface. 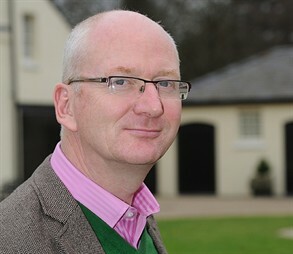 Mr Bechelet believes the key to implementing any change is being able to quantify what is happening now, and then being able to demonstrate the result of any actions. "Being able to measure change is vital to combat preconceptions of players and management," he said. "If you are going to raise the cutting height, for example, you have to show that the greens are still running as fast. The STRI Trueness Meter™ is designed to give the essential validation and help progressively assess future improvements in greens quality," he advised.